Elevating the mundane through his bold and playful works, London-based artist Joe Sweeney has been blending the banal with beauty since his graduation from the Chelsea College of Art in 2013. Residing in Brixton, 2016 was a big year for the London artist. Not only did he show his debut solo show 'Take Away' at Cob Gallery, he also began Don't Get Culty with Grace Pickering, an online platform for artists to showcase their practice, and brought to live his pop-up bar/installation Quality Produce. Incorporating commonplace objects found within the public and private spaces of Britain, Sweeney deconstructs them through his distinctive lens. The result? Tongue-in-cheek takes on British consumer culture that play with the nation's obsession with nostalgia, with a strong focus on the throw-away. 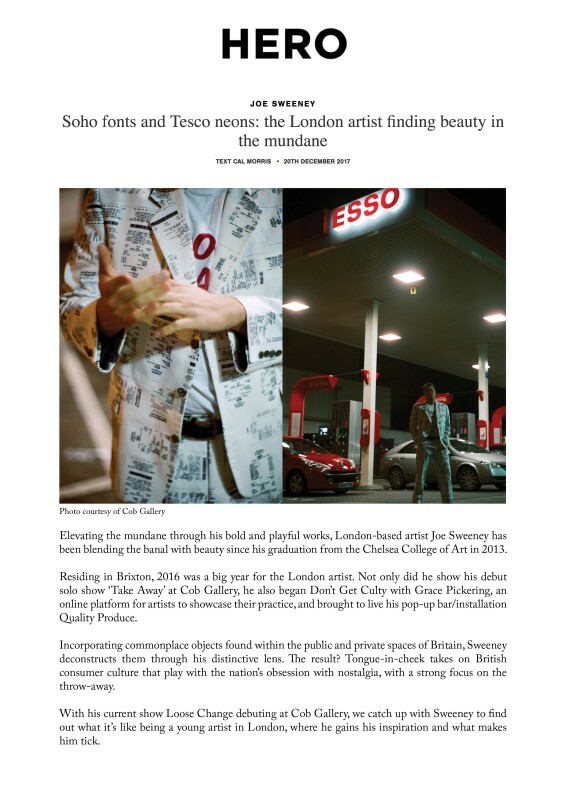 With his current show Loose Change debuting at Cob Gallery, we catch up with Sweeney to find out what it's like being a young artist in London, where he gains his inspiration and what makes him tick.